I don’t usually write to people like this because there are usually more productive things to do. However I’ll make an exception in this case. I didn’t see your earlier pieces on the so-called “terror roundup” but saw your Dominion piece on Friday and SST column last weekend. I thought both were shallow and sometimes pompous but more importantly they were a weak commentary on kiwi activism and potentially damaging in relation to the accused. Two weeks ago the police and SIS launched probably the most savage assault on the progressive movement in my lifetime. Your immediate instinct was to duck for cover and cut adrift a group of activists you can only surmise about. You preferred the long shadow cast by the state’s forces than, for example, engaging in battle to prevent the anti-terror laws being used for the first time. In fact I’m not sure you’ve even mentioned the anti-terror laws. Have you caught up with them yet and what they mean for civil rights in New Zealand? Dozens of young activists have been visited over the past two weeks by police with thick folders containing transcripts of every phone call, every text and every email they have sent in the past year. Is this not worth a mention? You then went further and gave active support to what you describe as the police thesis of an alliance between “Maori separatists and eco-anarchists”. Unlike other commentators you weren’t prepared to wait and see what evidence the police produce. 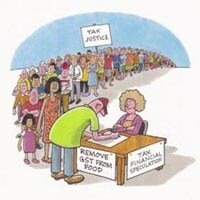 Instead you’ve been busy doing your best to bolster the state’s case in the public mind. I had the experience of sitting through a bail hearing for Rongomai Bailey last week. Despite being arrested on arms charges including being in possession of a Molotov cocktail the police agreed they were unable to produce any evidence he had ever even touched a weapon. They did produce surveillance transcripts of two bugged car journeys (which incidentally are inadmissible on the arms charges). The evidence itself is suppressed but suffice to say there was nothing in even the “juiciest” bits read to court in relation to Rongomai that would not be heard at any gun club in New Zealand on a Saturday afternoon. I’m sure the police will come up with a few headlines (Jamie Lockett “declaring war on New Zealand” was one) as time passes but I doubt any kind of credible terrorist threat will emerge despite it already being a reality in what seems to be your somewhat fevered imagination. As it stands you have aligned yourself with our state forces against good New Zealanders. It’s not the first time you’ve ducked. When the US/UK launched the attack on Iraq in 2003 you sided with Tony Blair against the rest of mankind. Why is it with the big issues you seem to lose the plot? Will you side with the US/Israel when they launch their long awaited attack on Iran? People who know you better than me tell me the problem is you are not connected in any meaningful way to any groups active in any particular issues so that your commentary is often theoretical and disconnected from daily struggle. I don’t know if this is true but it seems the only explanation that makes any sense to me. Don’t feel you have to respond Chris. I’ve said enough and am unlikely to have the time to respond again anyway. There’s plenty of real work to do. 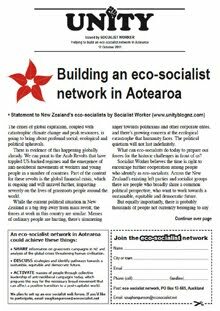 Your comrades in the International Socialist Tendency in Socialist Worker - New Zealand have watched what appears to be the unfolding disengagement of the Socialist Workers Party (Britain) from RESPECT - the Unity Coalition with gradually mounting concern, anxiety and frustration. SW-NZ’s perspective since 2002 has been that building new broad forces to the left of the social liberal (formerly social democratic) parties is an essential step towards the rebirth of a serious anti-capitalist worker’s movement. The work carried out by the SWP and its allies to build a broad coalition of the left which could compete with Blairite/Brownite New Labour on equal terms has been an inspiration to us, and, we believe, to all serious socialists throughout the world. In the last two months, to our distress, all the good work that has been carried out in England and Wales seems on the verge of going down the tubes. Whatever the rights and wrongs of the specific organizational proposals put to the Respect National Council by George Galloway MP in August, an outright civil war has broken out between the SWP leadership and other forces in Respect. This, as far as we can see, could - and should - have been avoided. It seems to us that your party’s leadership has decided to draw “battle lines” between itself and the rest of Respect - a stance, we believe, guaranteed to destroy the trust and working relationships on which any broad political coalition stands. Of particular concern to us is the expulsion of three respected cadre from the SWP - Kevin Ovenden, Rob Hoveman and Nick Wrack - for refusing to cut working relationships with those seen as being opposed to the SWP. To draw hard lines against other forces within a united front (even of a “special type”) and to expel members who refuse to accept those hard lines is behaviour you would usually see from a sectarian organization, not a party of serious socialists looking to build a new left alternative. It is perhaps in this context that Galloway’s reported comments about “Leninists” should be understood, rather than as an attempt to exclude revolutionary politics from Respect. What distresses us particularly is that the above mentioned comrades were expelled after submitting what seem to us to be thoughtful and critical contributions to your pre-conference Internal Bulletin. If these three comrades are not being victimized for raising a political alternative to the line of the Central Committee, it certainly gives the appearance of such victimization - or even, to use a word which has become common currency recently, witch-hunting. The critics of the SWP’s position have organised themselves under the slogan “firm in principles, flexible in tactics”. But separating principles and tactics in this way is completely un-Marxist. Tactics derive from principles. Indeed the only way that principles can become effective is if they are embodied in day-to-day tactics. It seems to us an uncontroversial statement that tactics must be based on much more than principles - a lesson which Lenin himself explained clearly in his famous “Left-Wing” Communism. Revolutionary tactics must be based on the objective realities of the time - the level of class consciousness, the balance of forces in society at any given moment, the resources and cadre available to a revolutionary organization. To derive tactics from principles is not the method of scientific socialism, but of a dogmatic or even sectarian approach, that the party is “schoolteacher to the class”. As we see it, the disaster overtaking Respect has been exacerbated by the SWP deriving tactics from principles. The principle is that “the revolutionary party” embodies the correct programme, that it must work as a disciplined unit to win its position, and that there is nothing to learn from reformist or other forces. This feeds into a tactical approach that any threat to the organizational leadership of “the revolutionary party” must be fought using all means at the party’s disposal, and those forces who oppose the strategy of the party must be eliminated if they do not accept defeat. According to the information we have, your party chose not to debate Galloway’s proposals openly within Respect first, and tease out the politics behind them. Rather, the SWP leadership first moved to neutralize internal dissent, before coming out fighting in Respect with accusations of “witch-hunting”. Instead of leading with the political arguments and winning leadership among the broad left forces in Respect, your leadership seems to have mobilized the party for a civil war waged primarily by organizational or administrative means. Inherent in this drive to defeat Galloway and his allies appears a “for us or against us” approach which seems to leave no room for any possible reconciliation - in effect, ensuring the death of Respect in its current form as a coalition of the broad left and a nascent transitional formation of working-class politics. An attempt by the SWP to establish dominance by sheer force of numbers at the upcoming Respect conference would, it seems to us, result in a Pyrrhic victory at best. Such a course of action, even if successful, would simply drive out those forces who are opposed to your party’s current line and leadership, and reconstitute Respect as a front for SWP electoral activities. We can not see this as encouraging class consciousness or political consciousness, among the SWP, Respect or broader left forces. On the contrary, it seems almost designed to harden the boundaries of organizational loyalty and the divisions between “the revolutionary party” and other forces - almost the definition of sectarianism. Again, if these stories are true, then Galloway’s comments about “Russian dolls” would seem to us - as revolutionary Leninists ourselves - to be fair comment. Of all the claims made against the SWP’s position the argument that Respect must be our “over-arching strategic priority” must be the most ill considered. Firstly, it ignores the fact that the building of a revolutionary party is the over-arching priority for any revolutionary Marxist. All other strategic decisions are subordinate to this goal. In an extraordinary speech at the ISO’s convention in December 2000, the group’s National Organizer, Sharon Smith, attacked the idea that the ISO could, by systematically focusing on this minority, “leapfrog” over the rest of the left, and insisted that methods of party-building forged in the downturn were necessary irrespective of the changing objective conditions. “Branches are now and will always be the measure of the size of the organization,” she said. The ISO-US was criticized for failing to see to that the gains from a revolutionary organization engaging properly in a broad movement, for both the organization and the class struggle, could not be simply quantified by how many members the organization gained. A sect with many members is of far less consequence in the class struggle than a smaller group of revolutionaries playing an organic leadership role in promoting political consciousness among the working classes and oppressed layers. We feel that the SWP may repeat the ISO-US’s mistakes - with the much greater consequences, this time, of the wreck of the biggest advance for the British left-of-Labour since the Second World War - if it lets Respect, as “only or primarily an electoral project”, crumble at this point. In contrast, Socialist Worker - New Zealand sees Respect - and other “broad left” formations, such as Die Linke in Germany, the Left Bloc in Portugal, the PSUV in Venezuela and RAM in New Zealand - as transitional formations, in the sense that Trotsky would have understood. In programme and organization, they must “meet the class half-way” - to provide a dialectical unity between revolutionary principle and reformist mass consciousness. If they have an electoral orientation, we must face the fact that this cannot be avoided at this historical point. Lenin said in “Left-Wing” Communism that parliamentary politics are not yet obsolete as far as the mass of the class are concerned - this is not less true in 2007 than it was in 1921. The question is not whether Respect should go in a “socialist” or “electoralist” direction, but in how Respect’s electoral programme and strategy can embody a set of transitional demands which intersect with the existing electoralist consciousness of the working class. The personality of George Galloway MP and the links with Muslim communities in London and Birmingham, seen in this light, are surely assets to be worked with, not embarrassments to be minimized. When Galloway came to New Zealand in July to support our campaign against Islamophobia, he electrified audiences with frankly some of the best political oratory that we have ever heard. No-one is claiming that he is a saint, or that he has not made some questionable political choices, but we refuse to believe that somehow over the space of a few months he has become a “communalist, electoralist” devil. The latest news that comes to us is that John Rees, a SWP CC member and the National Secretary of Respect, has publicly supported the four Respect councilors in Tower Hamlets who have resigned the Respect whip. If this is true, then the “civil war” in Respect has escalated to the point where the two factions are virtually functioning as separate parties - a “de facto” split much more harmful in practice than a clean divorce. This course of action is not only causing a serious haemorraging of cadre, but destroying the credibility which your party has built up as the most consistent and hard-working advocate of a new broad left in England and Wales. If the SWP appears to be attempting to permanently factionalise Respect, then it will be no wonder that other forces are trying to exclude them - not because of a “witch-hunt against socialists” (are you seriously claiming that Alan Thornett and Jerry Hicks are witch-hunting socialists?) but for reasons of simple self-preservation. · retract the expulsions of Kevin Ovenden, Nick Wrack and Rob Hoveman, at least pending debate at your party conference. If, on the other hand, Respect is finished as a united political force, it would surely be better for the two sides in this debate to approach the question of “divorce” amicably and calmly, rather than forcing the issue to a final conflict in the next few weeks and destroying the trust between the SWP and other forces on the left for perhaps a long time. I would also encourage your party to, as a matter of urgency, write a report for the information of your fellow members of the International Socialist Tendency, giving your analysis of the crisis within Respect and your long-term strategy for building a broad-left political alternative in Britain. If the police believe they have evidence of breaches of the law then they can lay charges under any number of legal provisions. Instead they have chosen to pursue charges under the Terrorism Suppression Act 2002. Behind this decision is the deeply political need to justify the huge extra resources and wide legislative powers the police and Security Intelligence Service have been given since 2001. They have to find terrorists. Uncovering criminal activity is not enough for these “wannabe terrorist fighters”. What the police are now doing is charging political activists under a law which would have made many of the civil disobedience protests from 1981 into “terrorist activities”. Activities such as the 40 people sitting on Rotorua airport runway, the invasion of the pitch in Hamilton and the blocking of the Harbour Bridge could all qualify. Meanwhile Attorney General Michael Cullen’s decision to delegate the responsibility for deciding charges to the Solicitor General is conveniently cowardly. This Terrorism Suppression Act is the Labour government’s law with the provision inserted by Labour for the Attorney General to approve terrorism charges. Cullen is now ducking for cover. He wasn’t so shy late last year when he intervened at a moment’s notice to quash attempts to bring alleged Israeli war criminal Mosche Ya’alon (“the butcher of Qana”) to justice. Cullen ordered the abandonment of the arrest warrant issued against Ya’alon by Auckland District Court Judge Avinash Deobhakta. Earlier Deobhakta had found there were “good and sufficient reasons” for the New Zealand police to arrest Ya’alon. To now pretend somehow that he should leave the decision to law experts is gutless. Cullen will be the subject of protest at the Labour Party conference this coming weekend. of Winston Peters's spittle-flecked dog whistling. arrested are brown is pathetic. torrent of abuse from Peters is par for the course. a range of groups with such unity for a long time in New Zealand protest. at every bend a taniwha. powers of the authority of Tuhoe and the Maori people. motuhake (sovereignty) and that of all Maori. Tuhoe people of the Urewera and of all Maori. I urge every New Zealander not to allow the state apparatus to take from you by default, legal rights people long before us fought for, died for. Thousands of protestors have rallied in a 'national day of action', opposing the so-called 'anti terrorism' raids, and calling for those arrested to be immediately released on bail. Among the crowd of a thousand in Auckland was Rongomai Bailey who is one of the handful of accused people already on bail. Johann Smith is passionate about his country, its people and their rights. And so the Wairoa local travelled more than 500 kilometres to Auckland to help lead the march against the police raids. The rally attracted more than a thousand protesters - Maori, pakeha, ethic groups, young, old, those with money and power, and those without. Together they marched - or in some cases wheeled - to Mount Eden prison, where most of those arrested are being held on remand. The crowd called for no charges to be laid under the terrorism suppression act against the 17 arrested and for the act to be dumped. Rongomai Bailey was among those who were arrested. He was allowed to address the crowd, but for legal reasons we can't identify him. In the garden city, protestors took a more civil approach..
Protestors are now drumming up support around the world - a rally is being held in london in a few hours. Eleven days on and the anger at the so-called terror raids is continuing to mount. Saturday saw another round of nationwide protests and instead losing interest in the cause, numbers are growing and emotions are running high. "We've got a very strong message here from the people of Auckland - from people right throughout New Zealand, and the world," says protester John Minto. A large crowd gathered in Auckland's city centre and marched to Mount Eden jail, where most of those arrested are being held on remand. Along the way there was a show of solidarity for Tuhoe Maori and Tame Iti, one of those still in custody. It was the same message in Wellington, where numbers were also up on last week's protest. They echoed the call for unity. "By picking out Tuhoe; by picking out Ureweras, it is a kind of strategy to divide different communities - something we need to be careful about and try to stick together," says protester, Dr Maria Bargh. There were also protests in Christchurch but this day of action isn't just confined to New Zealand. Demonstrations are also planned for Melbourne and London. They want the terrorist laws abandoned. One man now out on bail, Rongamai Bailey, says their colleagues should be released now. "I'm not a terrorist and the guys in Mount Eden are not terrorists," says Bailey. Until police show their hand this issue is unlikely to go away. "The government will ignore this movement at its peril," says Minto. raids a few weeks back. The march left downtown Auckland before arriving at Mount Eden Prison. the Probation service offices, opposite the old Mt Eden prison. the prison, perimeters of the grounds, while Police guarded the front gate. newsletter John Minto, Gereldene Peters and Mike Treen are producing. generation of Maori people activating and serving their people, to much. From old foes to new friends - former top cop Ross Meurant and political activist John Minto have spent 26 years on opposing sides, since the Springbok tour. But they have finally found a cause they agree on. Ross Meurant, the former top cop, renowned for taking a hard line on radical elements, and John Minto, the political activist involved in most left-wing groups and causes. Today for the first time they actually met, and buried the hatchet, united by their stance against the police terrorism raids. They came to each others attention in 1981 during the springbok tour, but never got closer than 50 metres. Both men were considered generals - Meurant directing the red squad, Minto the protestors. That same year, Meurant gave the long arm of the law a baton, which became known as the Minto bar. They say the police are now abusing their powers, and misusing legislation. John Minto will tomorrow lead the march for freedom; more than a thousand protestors are expected to join him. He did ask his new friend to join him - Meurant politely declined, saying it really isn't his thing. A 72-year-old socialist worker who has been protesting against the "anti-terror" raids had his own home searched by police yesterday over an alleged kidnapping. Jimmy O'Dea, a veteran trade unionist who has prostate cancer, said he had no idea why eight carloads of police arrived in the afternoon at his Bastion Pt home armed with a search warrant. "I was at home with my wife and kid and my dog started barking. I thought someone was there so I went out and I couldn't believe it - there were police everywhere. "I said, 'Are you the anti-terrorist searchers?' and they ummed and ahhhed. They said, 'We have got to search your house' and they showed me the warrant and said, 'You better read it'." The search warrant, which was granted by a district court judge on Tuesday, said police had reasonable grounds to believe that a number of items, including clothing, a chrome pistol and ammunition, hunting knife, pliers and a baseball bat, were at the house. The items were believed to be evidence of kidnapping, threatening to cause grievous bodily harm, blackmail and commission of a crime with a firearm. However, Mr O'Dea said he had no knowledge of any kidnapping or similar crime. "I don't commit crime like they are talking about. I was flabbergasted, to be honest." Solidarity Union secretary Joe Carolan said Mr O'Dea was helping to distribute pamphlets for a coming protest against the "terror raids" so the timing of the search on his own home was a strange coincidence. "We want to know why they think Jimmy is a bloody suspect, given he's 72 years old." Police spokeswoman Noreen Hegarty said Mr O'Dea was not a suspect in the kidnapping, nor did it have anything to do with the "anti-terror raids" or Mr O'Dea's stance on them. Ms Hegarty said the warrant was in relation to another man who was arrested on Tuesday after his own home was searched. The arrested man had given Mr O'Dea's address on his bail form so police had sought a new warrant and searched the property looking for evidence of the kidnapping. "It has absolutely nothing to do with any events to do with last week's raids." Mr O'Dea said last night he did not know the arrested man but had received mail addressed to a person in recent months. It was not clear if it was the same person who had been arrested this month. A long-time activist and friend of Tame Iti is labelling as "overkill" a police raid on his own home. Seventy-two-year-old Jimmy O'Dea's house in Auckland has been searched but authorities say it has nothing to do with terrorism. It all started with O'Dea's three border terriers. "I heard the dogs barking and I went to the front door and opened it and the place was covered in police," O'Dea says. Neighbours say eight car loads of officers came through O'Dea's front door. "I said what are you searching for and they wouldn't tell me," he says. Police produced a search warrant saying they were looking for a pistol, cell phone and ammunition. This was going to be quite a search because O'Dea has lived there 50 years and likes to keep his things close. "They found nothing as far as I know," he says. It's not the first time the police and O'Dea have not seen eye to eye. During the 1981 Sprinkbok tour they came through the back door O'Dea lost a battle with a police baton during a protest. Before that it was the 1975 land marches and the 1978 occupation of Bastion Point. 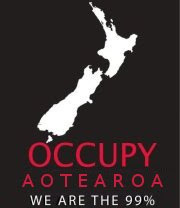 O'Dea is an Irishman who has stood beside Maori in many a protest. He has known Tama Iti for 30 years and knows those arrested two weeks ago. But according to police, Thursday's search has nothing to do with terrorism or Iti. They say is was all about a kidnap suspect arrested further up the street on Tuesday. Police also also say five cars not eight showed up as neighbours claimed. But it does say something about the current climate that a search warrant at an activist's house is suddenly news. And O'Dea thinks it is all to do with what happened in Ruatoki early last week when police raided suspected guerilla training camps and made a number of arrests for alleged weapons offences. "In the 50 years I've lived in this house and the 50 years I've lived in New Zealand I have never seen anything like this in my life," he says.